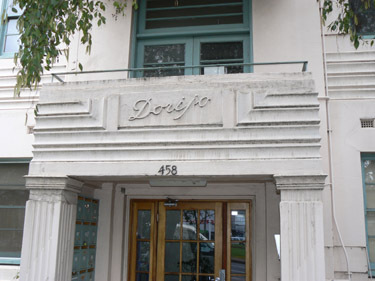 The entrance to Dorijo, a block of flats in Victoria Parade in East Melbourne, only hints at what a spectacular Art Deco building it is. 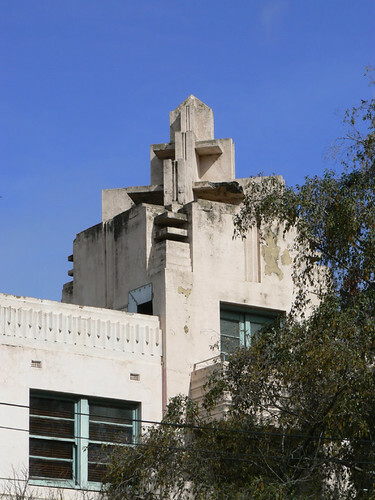 It was designed by I G Anderson in 1934 the similarities to his, now doomed to demolition, Lonsdale House are most obvious in the tower. A minor design aspect that attracts my eye is the reduction in the size of the three balconies as they progress up the facade. Each succeeding level is slightly smaller that the preceeding one. 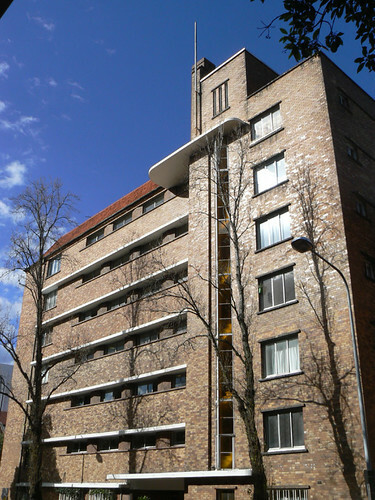 Marlborough Hall (1938) in Elizabeth Bay, Sydney was designed by architect Emil Sodersten. This asymetrical block of flats has a stepped roofline above the entrance with a flagpole at the highest point and, I suppose, a small rounded porch-like structure. I think it is too high to be an actual porch and besides there is a matching porch at street level. I like the feature of the triangle shaped amber coloured glass windows running the height of the building between the two porches. 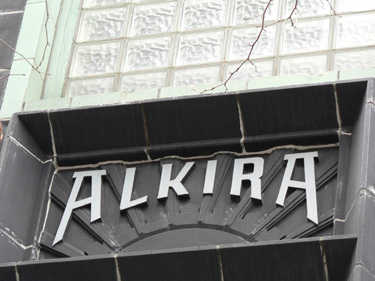 I don't know why you would rename a hotel but at least the old name is still on the top of the Art Deco curved facade. 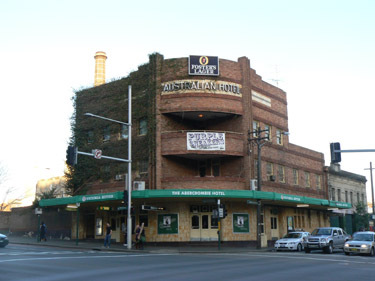 This is The Abercrombie Hotel on the edge of the former Carlton & United Breweries Old Kent Brewery site in Chippendale, formerly called the Australian Hotel. 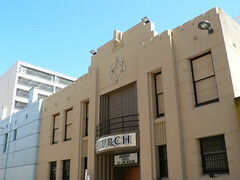 According to gdaypubs.com.au it was built in 1937 after the road had been widened and renamed Broadway. The old CUB site is subject to a major redevelopment by Frasers Property and for the time being is called Frasers Broadway. The hotel is due to close in mid-January 2010 to allow redevelopment of the site. 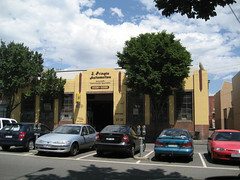 It has been recognised as a heritage building within the overall development and will be retained. 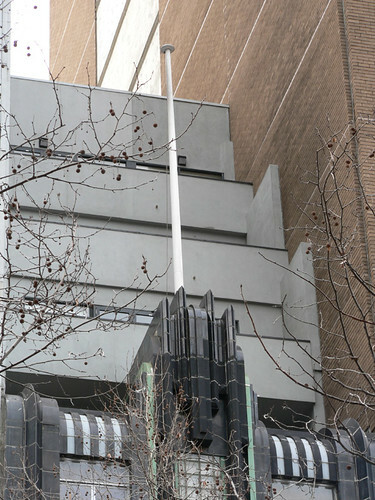 According to the plans, a new building will be erected over the top of the hotel but the Art Deco lines of the Australian Hotel will be clearly delineated. Although the new building will sit over the top of the hotel, it is proposed there will be a clearance of 4m. 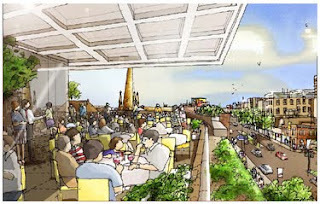 This artist's impression, from the Frasers Broadway website shows how the roof terrace at the Australian Hotel could look. 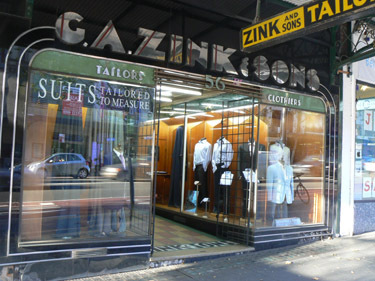 Established in 1895, G A Zink & Sons Tailors moved to their current premises at 56 Oxford St in 1911. 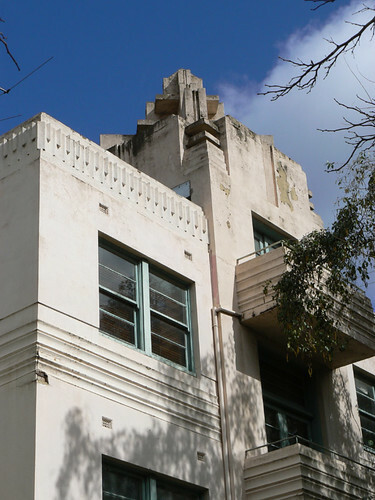 The second and three storey facade are certainly from this time but at some point later, the ground floor shopfront was remodelled in Art Deco style. And what a beautiful shopfront. Shiny black and silver with olive green strips along the tops of the windows and red highlight lines on the G A Zink lettering. 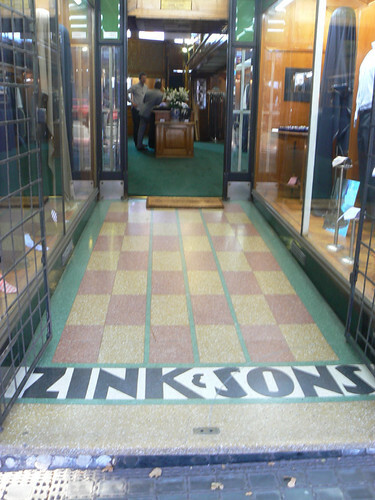 The terrazzo entrance bears a nice combination of pink and cream squares with three green lines leading to the doorway and styised Zink & Sons lettering. I had lunch with a friend in North Melbourne today. 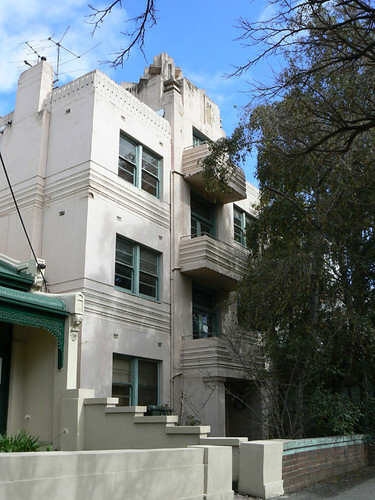 North Melbourne being a old part of Melbourne was established well before the deco period but in between the Victorian houses, shops and warehouses and the modern builds and conversions there are a number of nice interwar buildings. 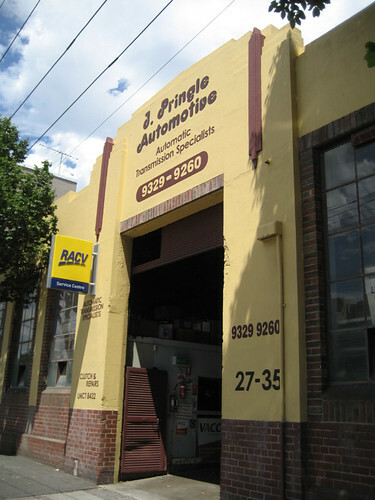 I spotted J Pringle Automotive from my trusty/rusty bicycle and had to stop to take a picture of two. 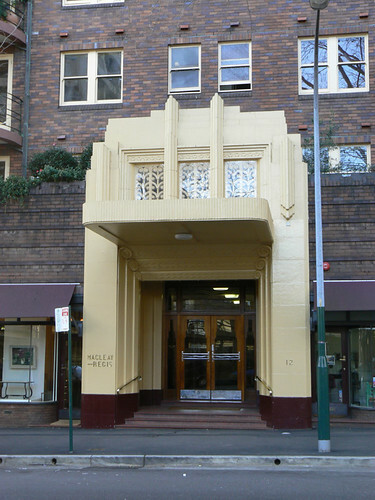 Yesterday, The New York Times plublished a story on the Sydney suburb of Potts Point mentioning the gorgeous mix of Art Deco apartments and Victorian terraces sitting among the restaurants and cafes of Macleay Street. 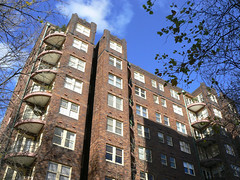 One of the best Art Deco apartment blocks in Potts Point is Macleay Regis at 12 Macleay Street. 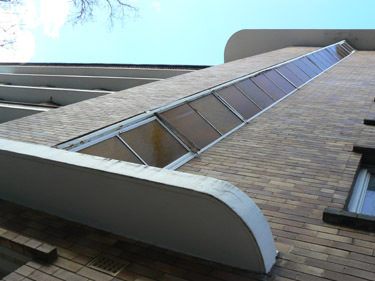 Designed by architect Eric C Pitt and built in 1939. The Library of NSW has a series of photos taken by Sam Hood in April 1939 showing the interior and exterior of this fabulous building. 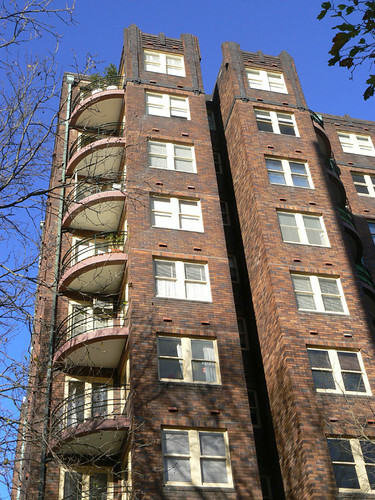 I took my photos on a typically glorious Sydney winter's day in July this year, 70 years after the construction of Macleay Regis. 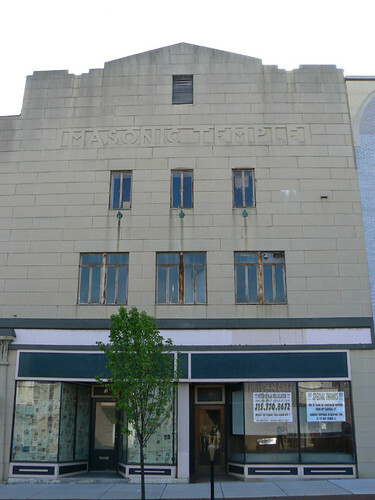 This is the former Masonic Temple in Auburn, NY. 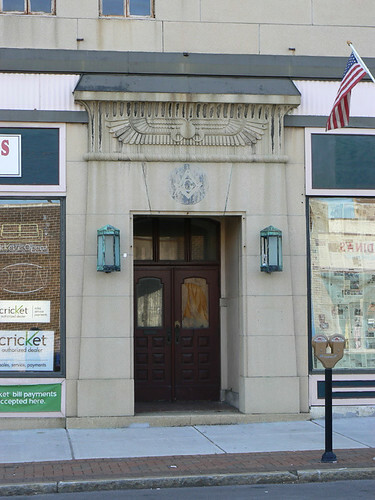 It isn't in the best state of repair but the lettering chiseled into the facade and the Egyptian style door point to better times for this stylish building. 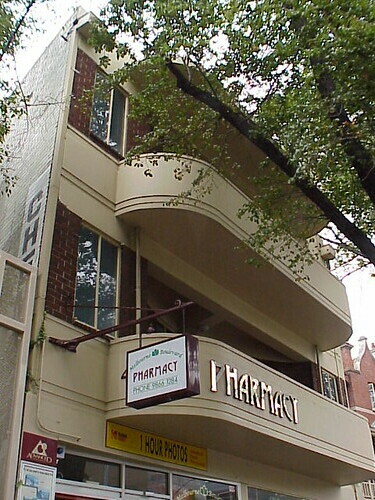 A chemist shop with apartments above in the inner Melbourne suburb of South Yarra. 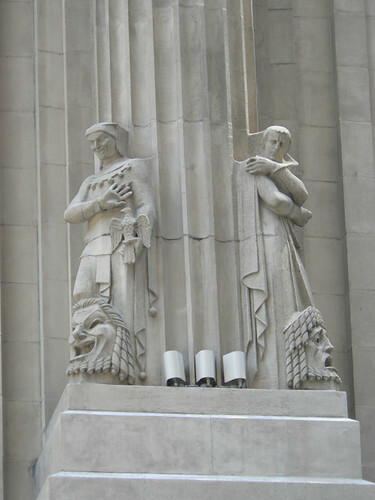 The Art Deco six-storey New York headquarters for the Hearst Corporation were completed in 1929. 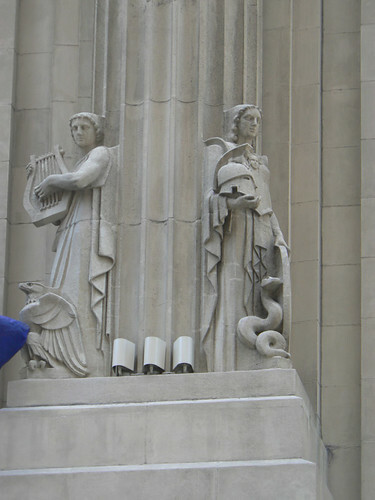 Newspaper magnate, William Randolph Hearst, choose architect and set designer Joseph Urban to design the building which included sculptural figures representing various aspects of the Arts, Commerce and Industry. 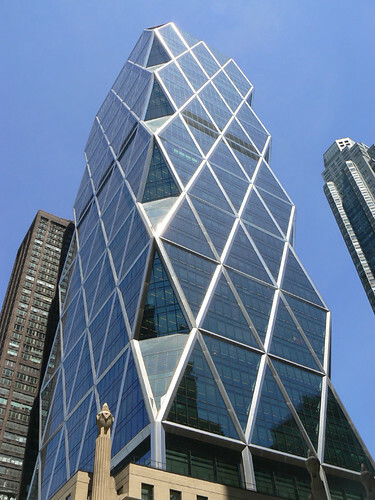 In the 21st century, Norman Foster designed a glass skyscraper for the Hearst Corporation. 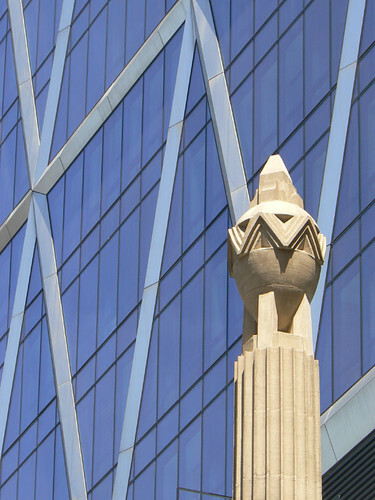 The Hearst Tower is 46 storeys tall and uses the original Hearst Building as its base. 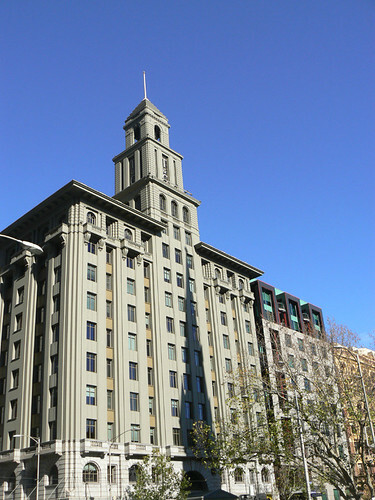 At one time the T&G Building dominated the Melbourne Skyline. 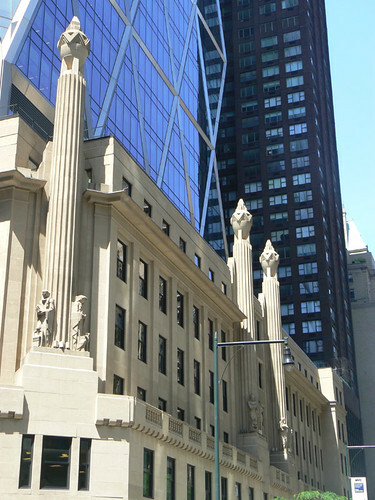 It is still a landmark but no longer the city's tallest building and no longer housing the T&G Insurance Company. 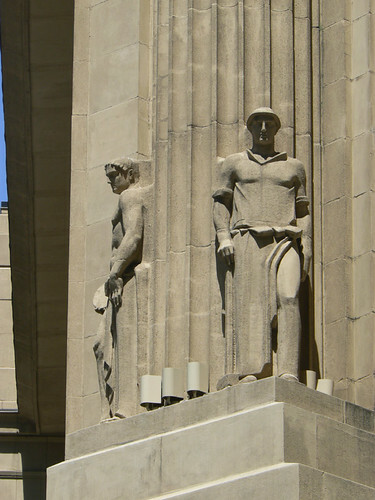 The building was designed by Anketell & Kingsley Henderson and constructed during 1928-29. 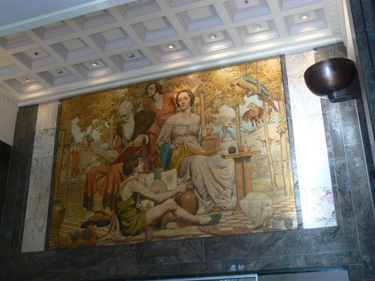 Around this time, Napier Waller completed a mural which still sits above the inner doorway at the Collins St entrance. Better Than to Squander Life's Gifts is to Conserve Them and Ensure a Fearless Future shows a group of figures, an old man, two woman and a young boy in a orchard setting with other figure in the background tending the land and watching the sheep. Orignally the building had two towers then in 1938, A&K Henderson, extended the building removing one of the towers and increasing the size of the remaining tower. In the early 1990s, the upper floors of T&G Building was effectively gutted and the structure was incorporated into KPMG House by architects Meiter3. 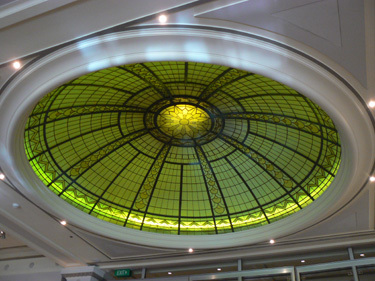 The ground level Banking Chamber became the public face of the new combined building retaining many of the original features from the T&G Building including the glass dome which is lit in a rotating sequence of colours using fibre optics. 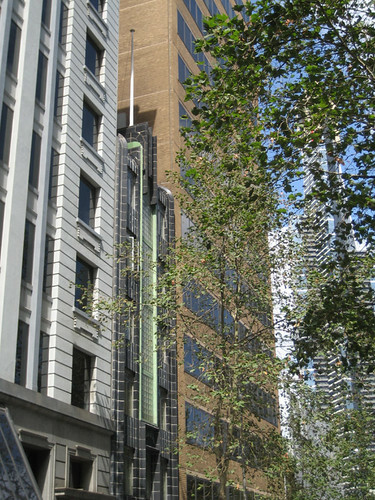 The T&G Building/KPMG House was one of the highlight buildings of Melbourne Open House 2009. Another deco building snapped from the car in a strange city. 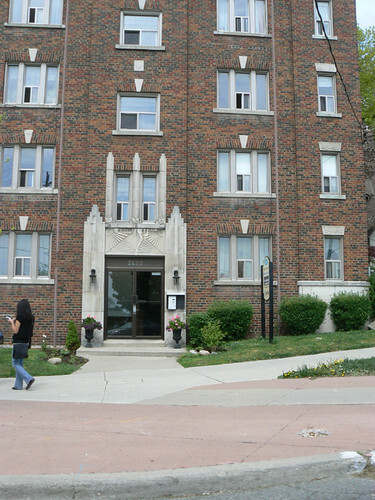 This is an apartment block in Toronto, somewhere out near the R C Harris Filtration Plant in the east of the city. 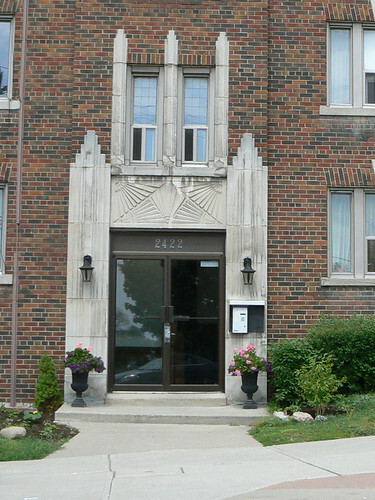 The decoration above the door can be seen on other apartment blocks around Toronto. In 1928 the Members Pavilion at the Melbourne Cricket Ground designed by architects Stephenson and Meldrum was completed. It was the third members pavilion at the ground following the sequence from the original stand in 1854 and it's replacement dating from 1881. The stand was not particularily Art Deco but there were a few things that caught my eye when I visited in September 2003 the day after AFL Grand Final had been played at the ground and a few months before this pavilion was demolished to make way for the most recent wave of re-development at the 'G' in preparation for hosting the Commonwealth Games in 2006. I couldn't go past this fabulous Art Deco clock that was above the door to the Members' Hall. 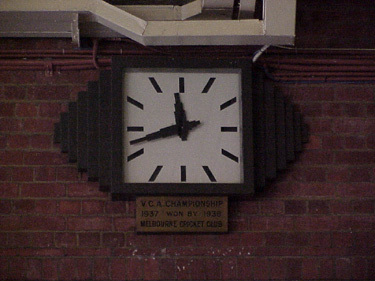 It appears to have been awarded to the Melbourne Cricket Club for winning the inaugural VCA Club Championship in 1937/38. 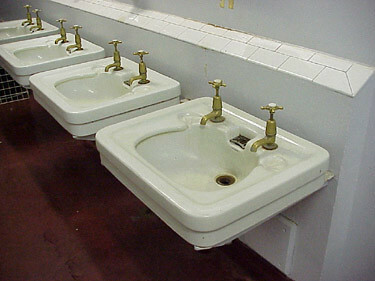 Practical, yet stylish washhand basins. 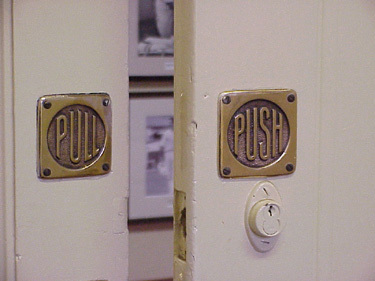 And I do like the pull and push door hardware with the out of focus glimpse of cricket photos through the gap in the door. I suppose it isn't good form to complain that there are too many trees in the streets of my home town of Melbourne. The problem is, I can't get a clear photo of one of my favourite Melbourne buildings, Alkira House. 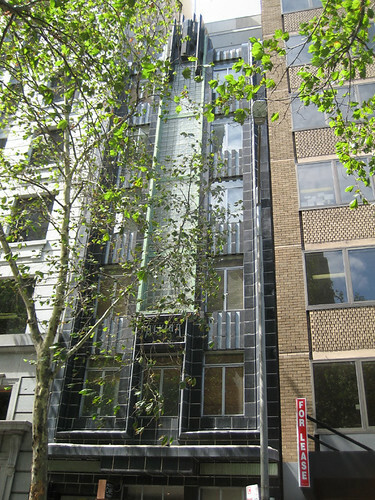 Alkira House is a beautiful little building with a facade of black and green faience tiles and a large section of glass bricks. 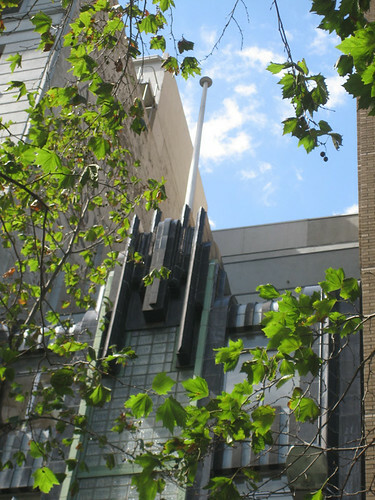 It is wedged between it's taller neighbours and probably goes unnoticed by many Melbournians. 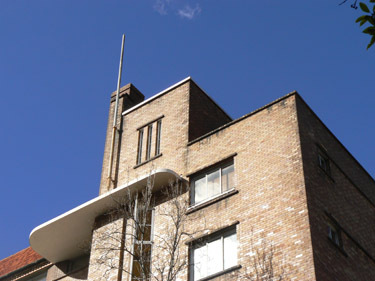 The building was designed by architect James Wardrop and constructed in 1937. 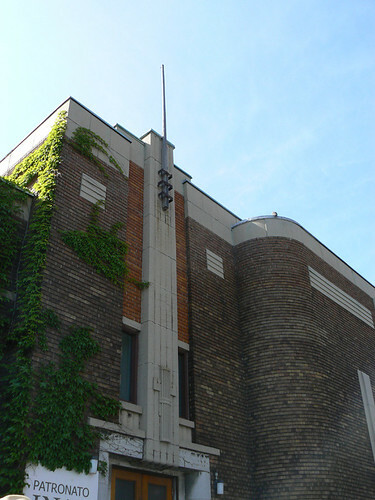 The rounded roofline is topped with a spectacularly sculpted pediment which serves as a wonderful support to the ubiquitous Art Deco flag pole. 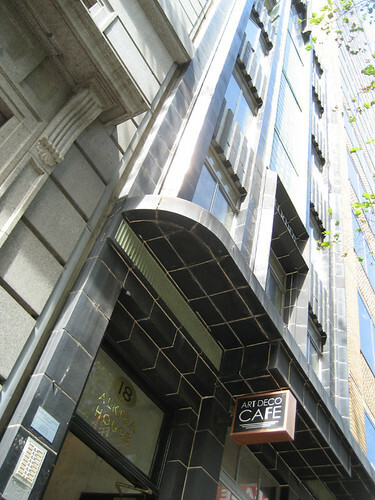 I'm not a coffee drinker but if you are around Queen St, I would recommend a visit to the Art Deco Cafe at No. 18, Alkira House just because it is a fabulous building. 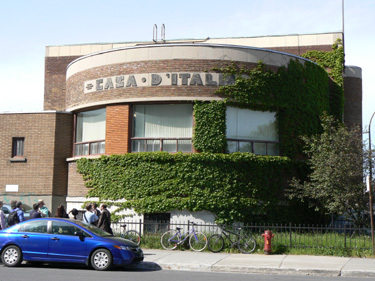 The Casa d'Italia was built in the mid-1930s as a social centre for the Italian community in Montreal. It was designed by Patsy Colangelo. 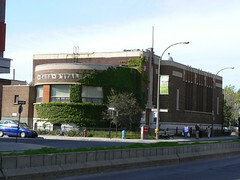 The main part of the building is rectangular with a semi-circular office at one end. Stylised lettering above the windows on this circular end spell out the name 'Casa d'Italia". At the other end of the building, 'Maison d'Italie' is spelt out in the same style of lettering. 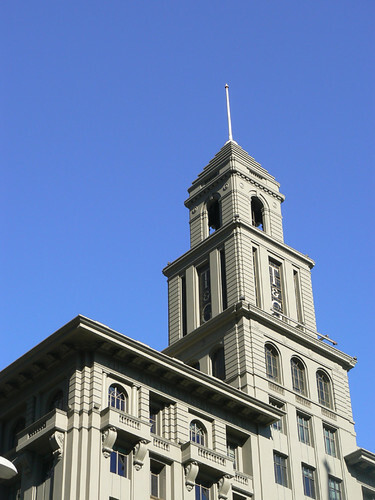 The main entrance is placed at one end of the rectangular section of the building marked with a flagpole at the roofline and a fasces above the doorway itself. Past the entrance the building steps out is a nicely proportioned streamline curve giving some extra width to the hall portion of the centre. 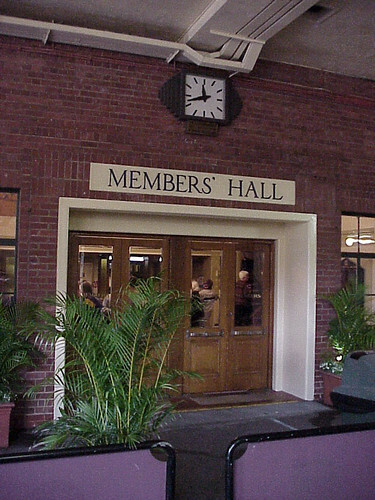 Nine vertical windows in three groups of three provide natural light for the hall and there are more fasces high along this side of the building. 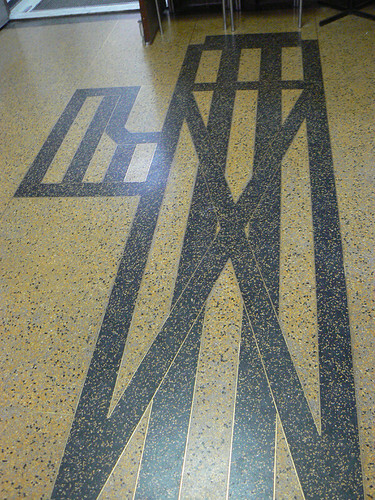 The small foyer inside the entrance also features a fasces in the pattern of the floor. I snapped this building on a weekend trip to Blackpool in 2001 and that is all I know about it. 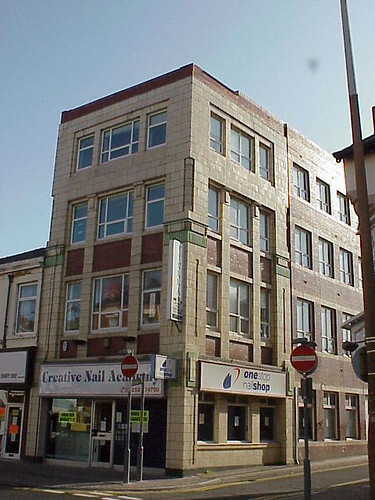 At the time it was home to the Creative Nail Academy but certainly had a different purpose when it was first built. 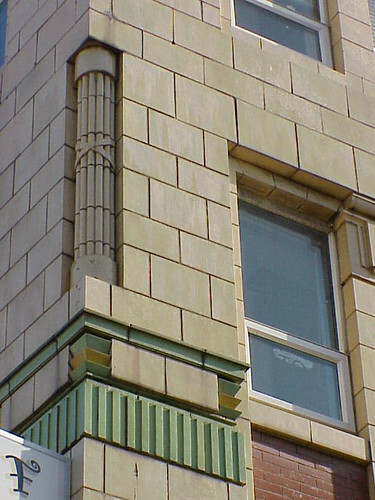 Perhaps a clue to the building's former use are the fasces which decorate the corners at the 3rd storey. 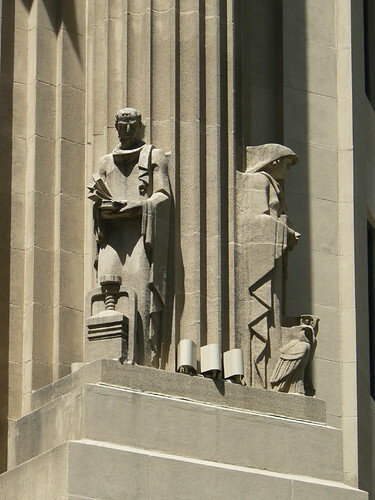 The fasces, an ancient Roman symbol for power, was adopted by the Italian facists during the 20s & 30s leading up to WWII which has somewhat soured this symbol to modern eyes. No doubt there is an interesting story behind why a building in Blackpool dating from this time has these fasces as part of the decoration. 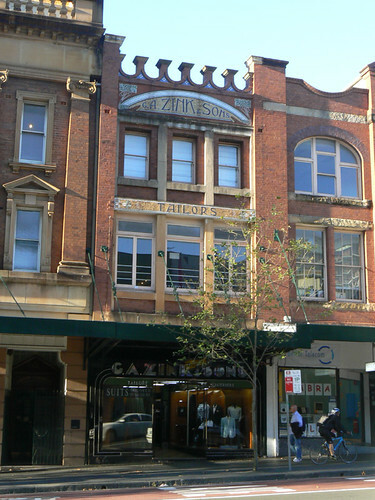 This is a former Synagogue in Synagogue Place off Rundle Street, Adelaide. When I took this photo a few years ago it was operating as Church Nightclub. A bit ironic since churches today seem to be taking many of the former entertainment palaces of the deco era, the cinema. I don't think it is a nightclub anymore. I think it is former Synagogue, former nightclub.